, an eminent divine among the dissenters, was born at Shrewsbury, Sept. 4, 1717, and at a proper age was sent to the free-school of his native place, where he went through the whole course of grammatical education, having stayed there somewhat more than eight years. In May 1733, he left the school, and went to Warrington, under the care of Dr. Charles Owen, the dissenting minister of that town, where he continued one year; after which, in August 1734, he went to Northampton, under the care of Dr. Doddridge, where he continued above seven years; and such was his progress in study, that in March 1738-9hewas chosen assistantto Dr.Doddridge in the academy; and he began his lectures in this capacity, with reading to the junior students in the classics and geography. About the same time he was examined before a committee of pastors in the neighbourhood, as to his qualifications for the ministerial office, and received an ample testimony of satisfaction and approbation. 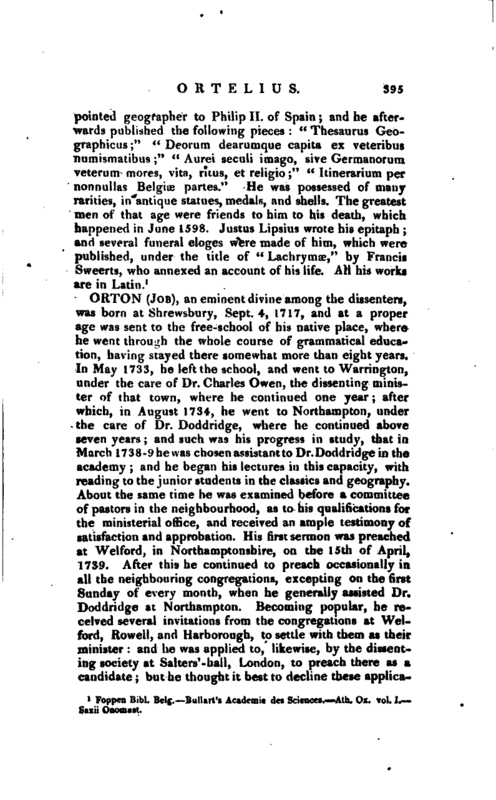 His first sermon was preached at Welford, in Northamptonshire, on the 15th of April, 1739. After this he continued to preach occasionally in all the neighbouring congregations, excepting on the first Sunday of every month, when he generally assisted Dr. Doddridge at Northampton. Becoming popular, he received several invitations from the congregations at Weiford, Rowell, and Harborough, to settle with them as their minister: and he was applied to, likewise, by the dissenting society at Salters’-hall, London, to preach there as a candidate; but he thought it best to decline these | applications, as, while he was assistant at Northampton, he wag engaged in a very useful employment, and had daily op­'portunities of improving himself superior to what he should have had in any other station. The enjoyment which he had of Dr. Doddridge’s conversation, was esteemed by him as a most peculiar advantage. 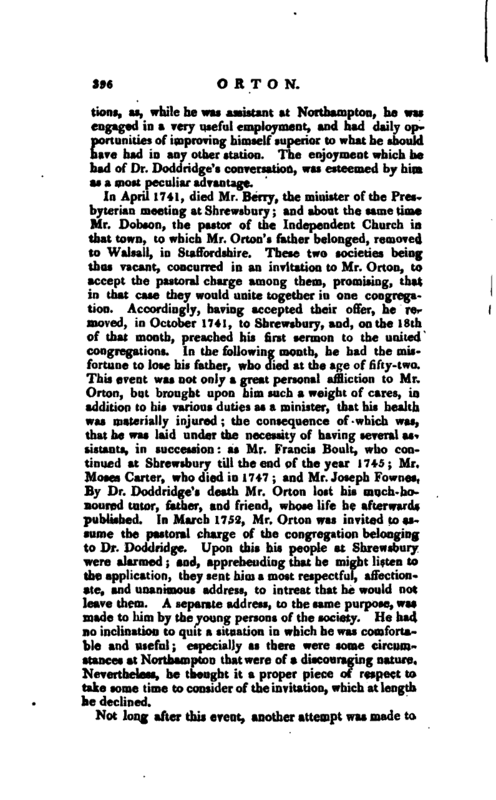 In April 1741, died Mr. Berry, the minister of the Presbyterian meeting at Shrewsbury; and about the same time Mr. Dobson, the pastor of the Independent Church in that town, to which Mr. Orton’s father belonged, removed to Walsall, in Staffordshire. These two societies being thus vacant, concurred in an invitation to Mr. Orton, to accept the pastoral charge among them, promising, that in that case they would unite together in one congregation. Accordingly, having accepted their offer, he removed, in October 1741, to Shrewsbury, and, on the 18th of that month, preached his first sermon to the united congregations. In the following month, he had the misfortune to lose his father, who died at the age of fifty- two. This event was not only a great personal affliction to Mr. Orton, but brought upon him such a weight of cares, in addition to his various duties as a minister, that his health was materially injured; the consequence of which was, that he was laid under the necessity of having several assistants, in succession: as Mr. Francis Boult, who continued at Shrewsbury till the end of the year 1745; Mr. Moses Carter, who died in 1747; and Mr. Joseph Fownes. 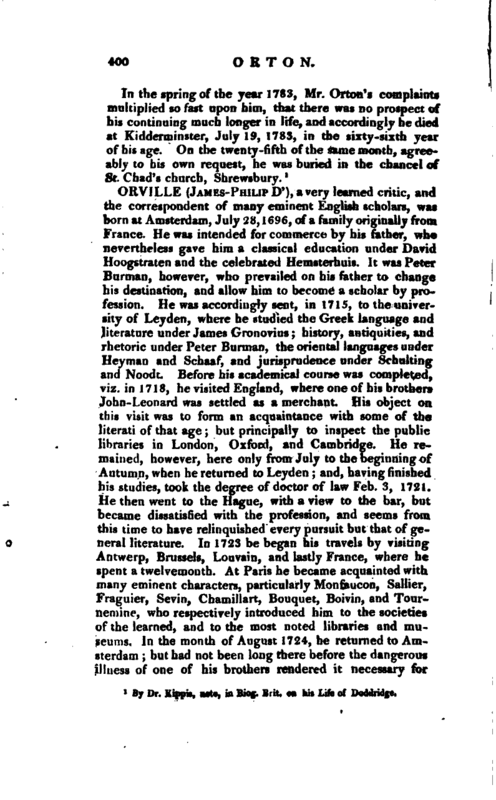 By Dr. Doddridge’s death Mr. Orton lost his much-honoured tutor, father, and friend, whose life he afterwards published. In March 1752, Mr. Orton was invited to assume the pastoral charge of the congregation belonging to Dr. Doddridge. Upon this his people at Shrewsbury were alarmed; and, apprehending that he might listen to the application, they sent him a most respectful, affection-r ate, and unanimous address, to intreat that he would not leave them. A separate address, to the same purpose, was made to him by the young persons of the society. He had no inclination to quit a situation in which he was comfortable and useful; especially as there were some circumstances at Northampton that were of a discouraging nature. Nevertheless, he thought it a proper piece of respect to take some time to consider of the invitation, which at length he declined. Not long after this event, another attempt was made to | draw Mr. Orton from Shrewsbury. He was applied to by a considerable congregation in Westminster, to succeed their late pastor, the Rev. Dr. Obadiah Hughes; but he immediately rejected the proposal, as he never had any inclination to settle in London, and as he was firmly persuaded that neither his health, nor his abilities, nor his sentiments, qualified him for a situation in the metropolis. On his refusal of this offer, it was accepted, in 1752, by the late Dr. Kippis. From this time nothing material occurred, in the course of Mr. Orton’s ministry at Shrewsbury, till the year 1765. He was comfortable and happy among his people, and in the friendship and assistance of Mr. Fownes. But in that year his bodily infirmities had so far advanced upon him, that he was quite disabled from continuing in his public work. On the 15th of September, therefore, (which was his birth-day) he delivered his last sermon to his congregation. The Lord’s Supper was administered by him several times after this; but he durst not undertake to preach any more. 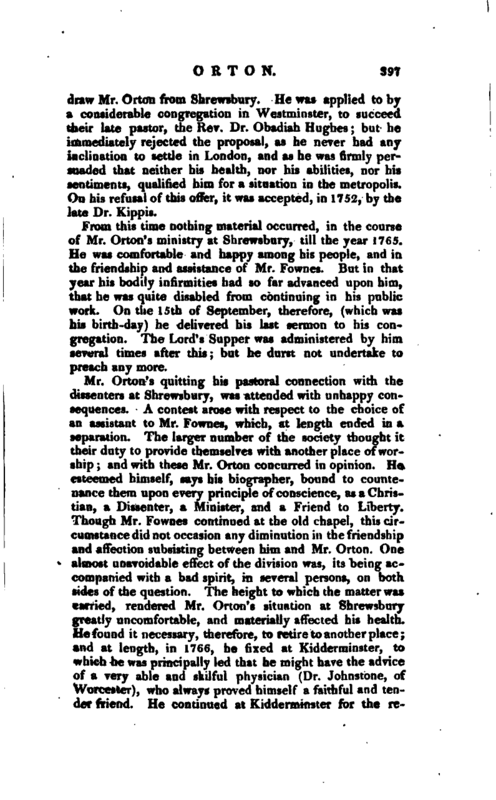 Mr. Orton’s quitting his pastoral connection with the dissenters at Shrewsbury, was attended with unhappy consequences. A contest arose with respect to the choice of an assistant to Mr. Fownes, which, at length ended in a separation. The larger number of the society thought it their duty to provide themselves with another place of worship; and with these Mr. Orton concurred in opinion. He esteemed himself, says his biographer, bound to countenance them upon every principle of conscience, as a Christian, a Dissenter, a Minister, and a Friend to Liberty. Though Mr. Fownes continued at the old chapel, this circumstance did not occasion any diminution in the friendship and affection subsisting between him and Mr. Orton. One almost unavoidable effect of the division was, its being accompanied with a bad spirit, in several persons, on both sides of the question. The height to which the matter was carried, rendered Mr. Orton’s situation at Shrewsbury greatly uncomfortable, and materially affected his health. He found it necessary, therefore, to retire to another place; and at length, in 1766, he fixed at Kidderminster, to which he was principally led that he might have the advice of a very able and skilful physician (Dr. Johnstone, of Worcester), who always proved himself a faithful and tender friend. He continued at Kidderminster for the | remainder of his clays; and although prevented, by the bad state of his health, from ever again appearing in the pulpit, he still retained the same zeal for promoting the great objects of the Christian religion. What he could not perform as a preacher, he was solicitous to effect as a practical writer. 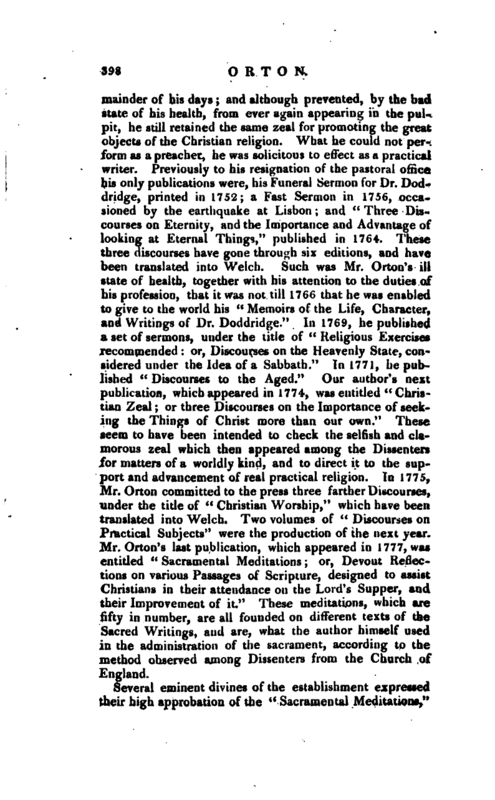 Previously to his resignation of the pastoral office his only publications were, his Funeral Sermon for Dr. Doddridge, printed in 1752; a Fast Sermon in 1756, occasioned by the earthquake at Lisbon; and “Three Discourses on Eternity, and the Importance and Advantage of looking at Eternal Things,” published in 1764. These three discourses have gone through six editions, and have been translated into Welch. Such was Mr. Orton’s ill state of health, together with his attention to the duties of his profession, that it was not till 1766 that he was enabled to give to the world his “Memoirs of the Life, Character, and Writings of Dr. Doddridge.” In 1769, he published a set of sermons, under the title of “Religious Exercises recommended: or, Discourses on the Heavenly State, considered under the Idea of a Sabbath.” In 1771, he published “Discourses to the Aged.” Our author’s next publication, which appeared in 1774, was entitled “Christian Zeal; or three Discourses on the Importance of seeking the Things of Christ more than our own.” These seem to have been intended to check the se!6sh and clamorous zeal which then appeared among the Dissenters for matters of a worldly kind, and to direct it to the support and advancement of real practical religion. In 1775, Mr. Orton committed to the press three farther Discourses, under the title of “Christian Worship,” which have been, translated into Welch. Two volumes of “Discourses on Practical Subjects” were the production of the next year. Mr. Orion’s last publication, which appeared in 1777, was entitled “Sacramental Meditations or, Devout Reflections on various Passages of Scripture, designed to assist Christians in their attendance on the Lord’s Supper, and their Improvement of it.” These meditations, which are fifty in number, are all founded on different texts of the Sacred Writings, and are, what the author himself used in the administration of the sacrament, according to the method observed among Dissenters from the Church of England. Several eminent divines of the establishment expressed their high approbation of the “Sacramental Meditations*” | among whom were the rev. Mr. Hunter, vicar of Weaverham, in Cheshire, Dr. Tucker, dean of Gloucester, and Dr. Adams, master of Pembroke college, Oxford. 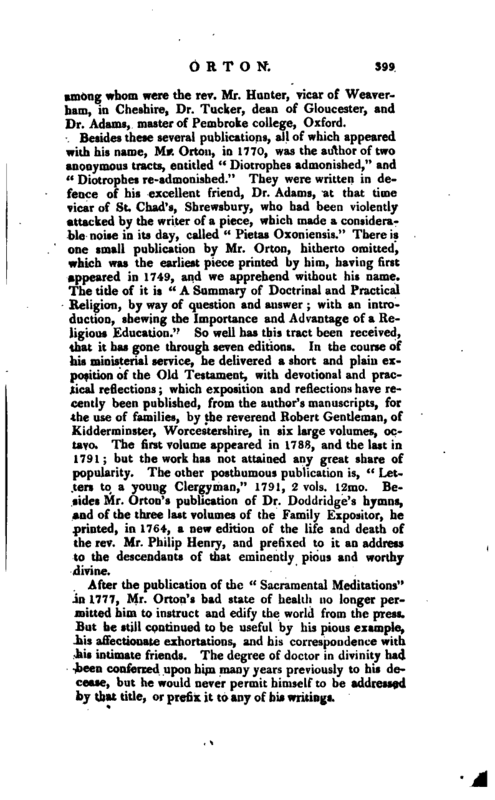 Besides these several publications, all of which appeared with his name, Mr. Orton, in 1770, was the author of two anonymous tracts, entitled “Diotrophes admonished,” and “Diotrophes re-adrnonished.” They were written in defence of his excellent friend, Dr. Adams, at that time vicar of St. Chad’s, Shrewsbury, who had been violently attacked by the writer of a piece, which made a considerable noise in its day, called “Pietas Oxoniensis.” There is one small publication by Mr. Orton, hitherto omitted, which was the earliest piece printed by him, having first appeared in 1749, and we apprehend without his name. The title of it is “A Summary of Doctrinal and Practical Religion, by way of question and answer; with an introduction, shewing the Importance and Advantage of a Religious Education.” So well has this tract been received, that it has gone through seven editions. In the course of his ministerial service, he delivered a short and plain exposition of the Old Testament, with devotional and practical reflections; which exposition and reflections have recently been published, from the author’s manuscripts, for the use of families, by the reverend Robert Gentleman, of Kidderminster, Worcestershire, in six large volumes, octavo. The first volume appeared in 1788, and the last in 1791; but the work has not attained any great share of popularity. The other posthumous publication is, “Letters to a young Clergyman,” 1791, 2 vols. 12mo. Besides Mr. Orton’s publication of Dr. Doddridge’s hymns, and of the three last volumes of the Family Expositor, he printed, in 1764, a new edition of the life and death of the rev. Mr. Philip Henry, and prefixed to it an address to the descendants of that eminently pious and worthy divine. By Dr. Kippis, note, in Biog. Brit. on his Life of Doddridge.